TO REDEEM OFFER: Add a qualifying in-stock full-priced PINK item(s) to your shopping bag. Enter offer code PINK30NOW at checkout. The price of your highest priced item will be adjusted after offer code is applied (one discounted item per order). Valid November 30, 2018 through December 2, 2018 at 11:59pm PT. OFFER EXCLUDES THE FOLLOWING: UGG® Australia, Designer Collaboration products, Victoria's Secret Lingerie, Victoria's Secret Beauty, clearance (items with prices ending in $.99), gift cards, gift wrap & kits do not qualify toward offer eligibility. Not valid on offers that provide discounts on an item or your entire order, previous purchases or store purchases. ADDITIONAL OFFER DETAILS: Offer value is subject to adjustment: if items are returned, cancelled or exchanged, the offer's value will be deducted from your refund. Discount cannot be redeemed for cash or used as payment toward your Victoria's Secret Angel Credit Card. Offer may be modified or discontinued at any time without notice. Offer valid in-stores November 29, 2018 through December 3, 2018. Up to $10.50 value. Excludes clearance. Individual items priced as marked. While supplies last. Offer valid November 30, 2018 at 6am ET through December 2, 2018 until 10pm ET. 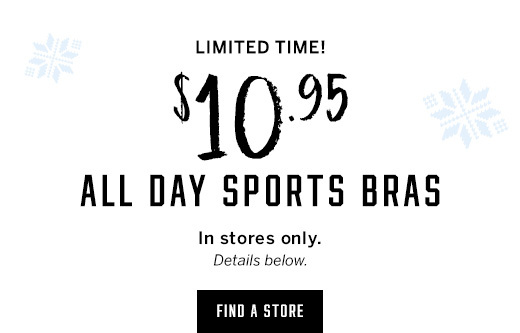 Regularly up to $10.50 value. Excludes clearance. Individual items priced as marked. While supplies last. Offer valid November 29, 2018 through December 3, 2018 until 11:59pm PT. In stores and online. While supplies last. TO REDEEM OFFER: Add qualifying in-stock item(s) totaling $85 USD or more to your shopping bag. 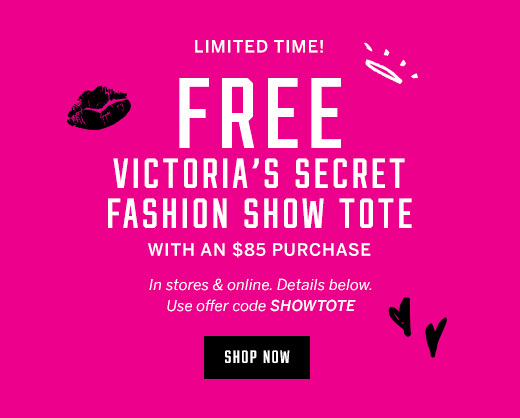 Enter offer code SHOWTOTE at checkout. A free tote will be added to your bag after code is applied (one free tote per order). Valid December 2, 2018 through December 3, 2018 11:59pm PT; while supplies last. OFFER EXCLUDES THE FOLLOWING: Clearance (items with prices ending in $.99), gift cards, gift wraps & kits do not qualify toward offer eligibility. Not valid on previous and store purchases and any other promotional gift with purchases. ADDITIONAL OFFER DETAILS: Tote: Canvas; 11.8" H x 6.7" W x 13.4" L. No substitutions. Discount cannot be redeemed for cash or used as payment toward your Victoria's Secret Angel Credit Card. Offer subject to adjustment due to returns, cancellations and exchanges. Orders shipping outside the US may not be eligible; additional taxes and duties may apply. Offer may be modified or discontinued at any time without notice. TO REDEEM OFFER: Add qualifying in-stock items totaling $25 or more to your shopping bag. Enter offer code SHIP25VS at checkout. Standard shipping & handling charges will automatically be deducted for eligible orders after offer code is applied. Valid December 2, 2018 at 10:00 pm ET through December 3, 2018 at 3:00 am ET. OFFER EXCLUDES THE FOLLOWING: Shipping & handling, taxes, gift cards, gift wrap & kits do not qualify towards the minimum purchase. Not valid on previous purchases, store purchases or with any other shipping offers. Not valid on packages shipping to P.O. Box or APO/DPO/FPO addresses. ADDITIONAL OFFER DETAILS: Valid for free standard shipping & handling anywhere in the United States and Canada. Not valid with any other shipping offers. Can be combined with SAVE20VS. Offer subject to adjustment due to returns, cancellations and exchanges. Offer may be modified or discontinued without notice. TO REDEEM OFFER: Add qualifying in-stock items totaling $150 USD or more to your shopping bag. Enter offer code SAVE20VS at checkout. The cost of your purchase will be adjusted after offer code is applied (One discounted purchase per order). Valid December 2, 2018 at 10:00 pm ET through December 3, 2018 at 3:00 am ET. 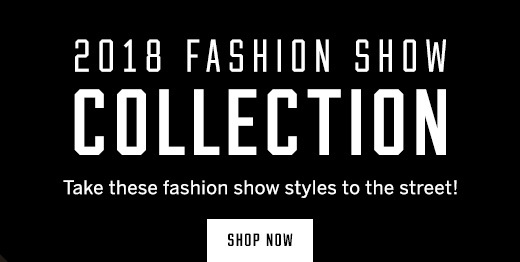 OFFER EXCLUDES THE FOLLOWING: UGG® Australia, Victoria's Secret Design Collaboration products, Clearance (items with prices ending in $.99), gift cards, gift wrap & kits, store and previous purchases do not qualify toward offer eligibility. Shipping & handling and taxes do not qualify towards the minimum purchase. ADDITIONAL OFFER DETAILS: Not valid with any other offers that provide discounts on your entire order. Offer value is subject to adjustment: if items are returned, cancelled or exchanged, the offer's value will be deducted from your refund. Discount cannot be redeemed for cash. Additional taxes and duties may apply. Offer may be modified or discontinued without notice. TO REDEEM OFFER: Add qualifying in-stock PINK Beauty items totaling $25 or more to your shopping bag. Enter offer code PINKSTOCKING at checkout. A free stocking will be added to your bag after code is applied (one free stocking per order). Valid November 26, 2018 through December 5, 2018 at 11:59pm PT; while supplies last. OFFER EXCLUDES THE FOLLOWING: Clearance (items with prices ending in $.99), gift cards, previous and store purchases. Not valid with any other promotional gifts with purchase. ADDITIONAL OFFER DETAILS: No substitutions. Discount cannot be redeemed for cash or used as payment toward your Victoria's Secret Angel Credit Card. Offer subject to adjustment due to returns, cancellations and exchanges. Orders shipping outside the US may not be eligible; additional taxes and duties may apply. Offer may be modified or discontinued at any time without notice. 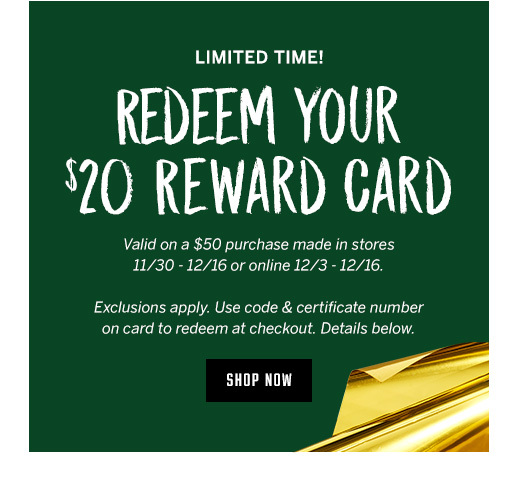 This $20 off a $50 purchase promotional reward card is redeemable in stores November 30 – December 16, 2018 or online and by phone December 3 – December 16, 2018 in a single transaction on full-priced merchandise only. Redeemable in the U.S. only online, by phone or in stores, excluding outlets, stores in airports or on cruise ships. This reward card has no value until November 30, 2018 and expires on December 16, 2018 at 11:59 p.m. PST. Stores: Present this card to receive $20 off a full-priced purchase of at least $50. May be redeemed only once. Card must be surrendered at time of redemption. Online: Add qualifying in-stock merchandise totaling $50 or more to your shopping bag. Enter offer code at checkout. When prompted, enter certificate number. Offer code and certificate number combination can only be redeemed once. Order amount will be adjusted after offer code and certificate number are applied. Both: Limit one reward card per customer per transaction. Card cannot be redeemed for cash. Clearance (prices ending in $.99) and sale items, shipping & handling, taxes, gift wrap & kits and gift cards do not qualify for minimum purchase requirement or redemption. Offer value is subject to adjustment: if items are returned, canceled or exchanged, and the offer's value will be deducted from your refund. 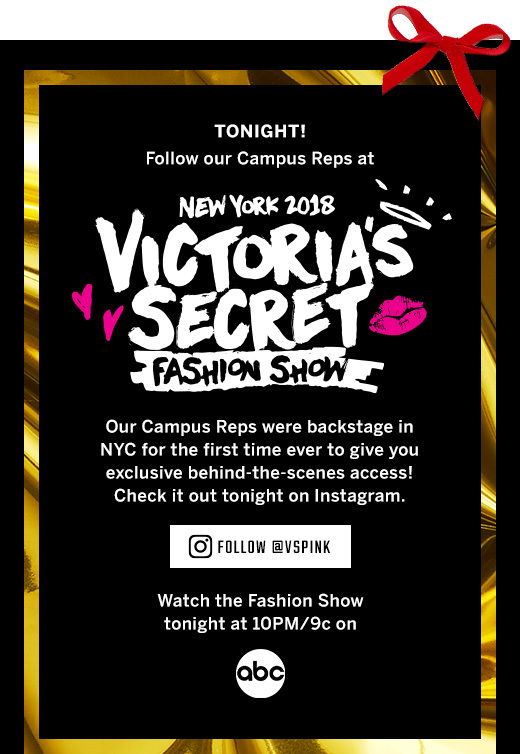 Card cannot be used as payment toward your Victoria's Secret Angel Credit Card or used with another coupon, dollar off offer, discount or introductory offer, but can be combined with Angel Rewards. Not valid on previous purchases. Associates of Victoria's Secret and its affiliates aren't eligible. Offer may be modified or discontinued at any time without notice. Void if altered, copied, transferred, auctioned or sold. Card will not be replaced if lost or stolen. Local and state taxes may apply to any purchase and is the responsibility of the purchaser. TO REDEEM OFFER: Add qualifying in-stock items totaling $75 or more to your shopping bag. Enter offer code SHIP75 at checkout. Standard shipping & handling charges will automatically be deducted for eligible orders after offer code is applied. Valid November 29, 2018 through December 2, 2018 at 10:00 pm ET. OFFER EXCLUDES THE FOLLOWING: Shipping & handling, taxes, gift cards, gift wrap & kits do not qualify towards the minimum purchase. Not valid on previous purchases, store purchases or with any other shipping offers. ADDITIONAL OFFER DETAILS: Valid for free standard shipping & handling anywhere in the United States and Canada. Not valid with any other shipping offers. Offer subject to adjustment due to returns, cancellations and exchanges. Offer may be modified or discontinued at any time without notice.